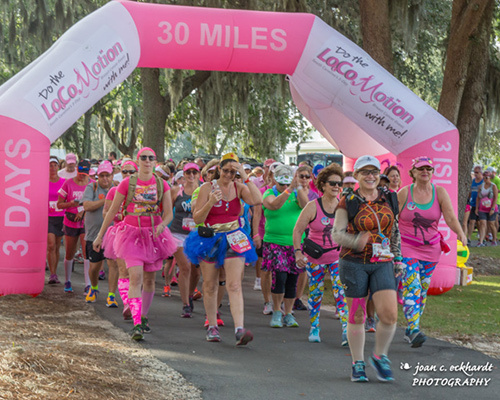 Imagine a three-day race in which participants (both male and female) walk/run 30 miles wearing pink tutus, wigs, angel wings, knee high socks, sweat bands, beaded necklaces and fake tattoos. A race without a clock or drenched in competition, but rather people laughing, talking and even dancing in sync with anyone from close friends and family members to complete strangers. A race that, in the end, leaves you replenished rather than exhausted. Such a race exists here in the Lowcountry. It’s called Pledge the Pink. Pledge the Pink, however, doesn’t utter the word “cancer.” It shouts it loud and proud in hopes of rallying people behind one particular form of the disease that afflicts one in eight women—breast cancer. “Our participants come from 48 states. 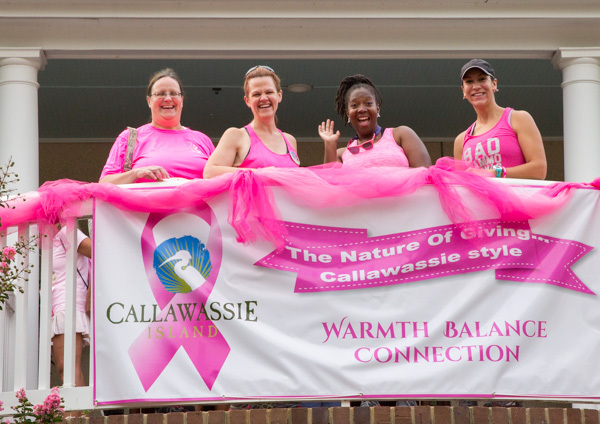 We wear pink, give sweaty hugs, build blisters, sing songs, and most importantly save lives,” said event organizer Laura Morgan. You can also expect to be moved. 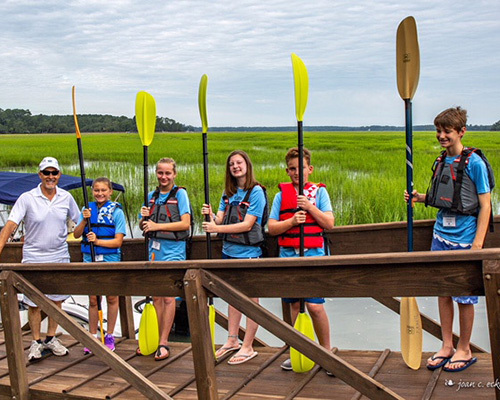 During the 10-mile route, Callawassie Islands leads you along an emotional journey. You laugh. You reflect. You cheer. You might even cry. And throughout, there is this sense that the Callawassie Island community is holding your hand every step of the way. It is this type of camaraderie that truly makes a positive difference in our fight against breast cancer. 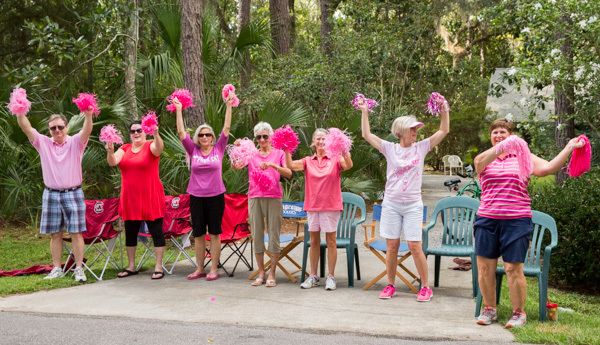 The Pledge the Pink Callawassie Island leg, with all its supportive and fun-loving energy, instills hope and reminds us all about the power we can generate when we come together. 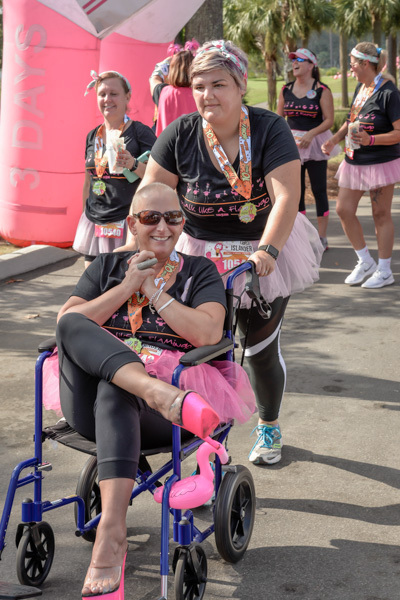 This year, a woman without hair but not without personality, donned a pink tutu and outrageously high platform shoes as her friends pushed her wheelchair. “Do you know her story?” asked Anderson. 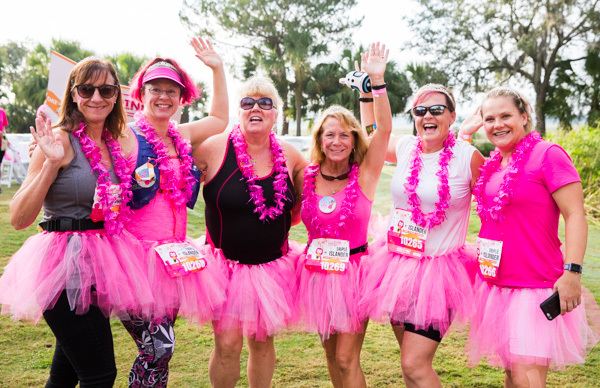 “She raced last year for fun and was motivated to get a mammogram after the race. She found out she had breast cancer and is now undergoing treatment.” Anderson is visibly touched by the woman and her story. As racers began to advance to the starting line, other Callawassie Island volunteers applaud and shout words of encouragement for the survivors leading the pack. 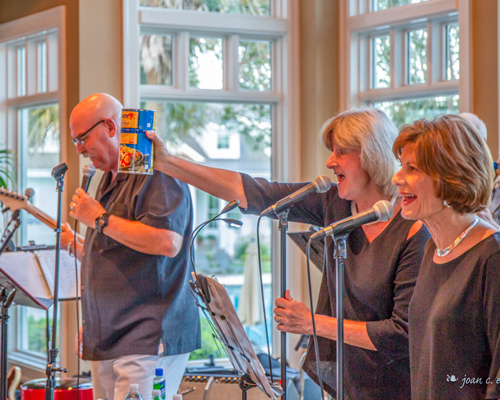 It was then that this woman smiled wide, tipped her head back toward the sun, and yelled, “Whoop, whoop!” Today she was not going to let cancer drain her. Instead, today she was going to soak up the Callawassie Island lifestyle. She was going to simply enjoy life. 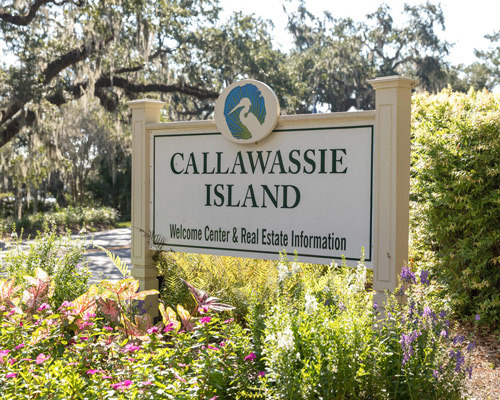 And all thanks to an amazing display of hospitality and love from Callawassie Island’s residents.